Hello there, how are you today? I have been so busy lately planning my Christmas events and the first one takes place locally on the 28 of August, email me if you would like to attend and I will send you all the details. I simply adore this combo, stylish and so very grown up I think these will be the cards I will send this year to all my friends and family ( Kraft, Soft Suede and Whisper White YUMMY). I also love these two stamp sets together, Serene Snowflakes from the mini and the very popular Dasher, if you haven't ordered him yet what are you waiting for? is THE must have stamp this season . Do you like the look of this class but you are miles away to sample it locally? 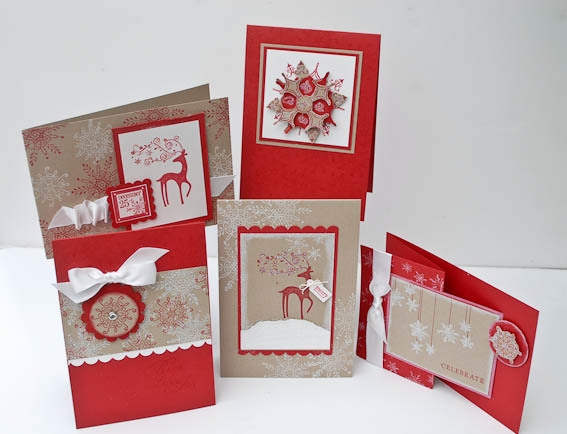 NOT A PROBLEM I have put together a fab kit that will include all the supplies needed to make TEN CARDS (2 of each design shown above). The kit is a fabulous value of £35.99 (including shipping). You also have the choice of choosing your colourway, the second choice is in Real Red, Kraft and Whisper White. 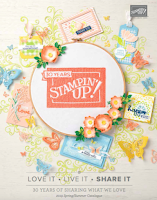 10 card kits all cut and ready for you to start the fun part of stamping and assembling, wohooo all the hard work is done for you !!! You will need to provide your own sentiments, punches, glue and glitter, if you need to order anything in addition to the kit please let me know. Please note that from 1st October 2010 due to the price increase you will no longer receive the bolt of ribbon with this kit, should you wish to purchase it separately please let me know. 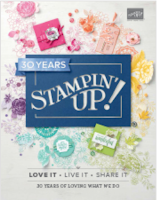 Do you have some of the stamps or ink pads already? Simply place an order for anything you wish for up to the £36 value, it can be anything you want). If you want to change your kit selection simply tell me what you want to replace in the comments box or email me on telemech01@aol.com. 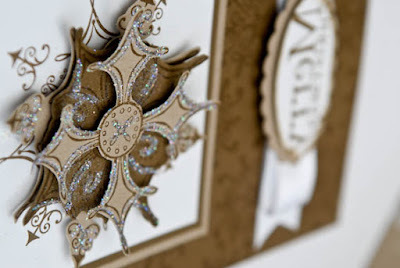 Here's a close up of one of the cards I love the big snowflake for the layering potential it has. Monica I love the colours, those cards are beautiful!! Both colour combos look fantastic! Oh my, Monica these are just stunning, I love them all and the colours too! Wow - the cards are so awesome! Beautiful! I love them! And also colours - they are wonderful! Gorgeous, gorgeous kits Monica. Even now I'm an SU demo it makes me want to buy them! These are gorgeous, Monica! 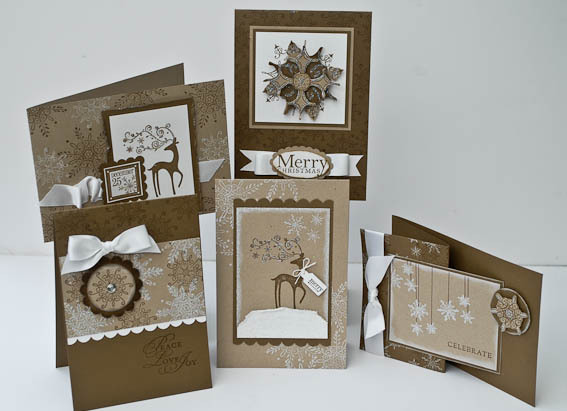 I love the layouts and the kraft / cream colour scheme is very sophisticated! Hope you've got my email (now that I've finally had time to reply).